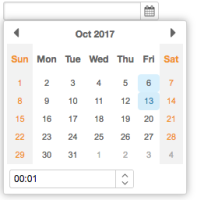 Users can specify a default time for Timebox in the calendar popup before users set a date. In this use case, we can't set the time by calling Datebox.setValue() since we don't want to set the date. Jumper suggested once we upgrade the minimal Java edition requirement to 8+, we can use java.time.LocalTime or similar class to implement this feature. rudyhuang added a comment - 10/Sep/18 9:57 AM Jumper suggested once we upgrade the minimal Java edition requirement to 8+, we can use java.time.LocalTime or similar class to implement this feature.